The Ways of the Wayments: IN. SANE. Holy crap. Did everyone see the men's snowboarding halfpipe competition tonight?! 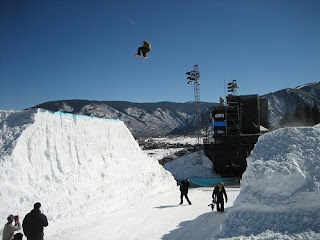 Shaun White was freakin' CRAZY! I STILL can't believe the things he can do on a board. Amazing! He won the gold, scoring over three points higher than the silver medalist! I can't believe how high he got on those jumps, and that last trick he did his last run was IN. SANE. wowwwwwww!! Bravo, dude. Bravo. He had 2 amazing runs. And nobody could even get close to the air he was pulling outside of the pipe. It was amazing!